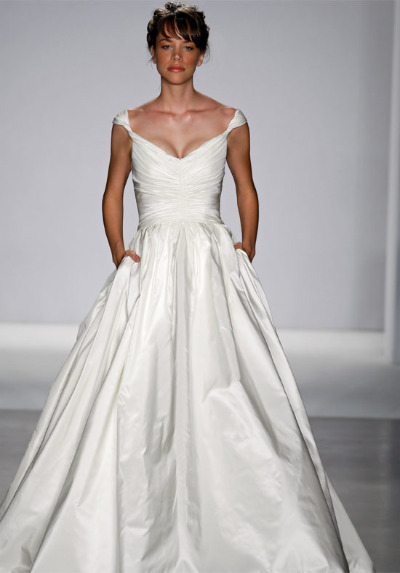 bride.ca | 2011 Trends: Wedding Dresses with Pockets? Over the last year or so, a new, practical trend in wedding dresses has emerged - gowns with pockets. Pocket wedding dresses allow the bride to carry a lipstick, compact mirror, tissues or even a cell phone (but please, turn it off during the ceremony!). I know what you are probably thinking... how tacky! But these wedding gowns don't have big flap pockets on the front. Most of the dresses have the pockets discreetly and subtly hidden between the pleats or on the seams. Let's take a look at some of these fantastic pocket wedding dresses. This pocketed gown from Rosa Clara features origami-like pleating. It has a contemporary feel with its unique neckline but would be suitable for any type of wedding including a traditional church affair. Rosa Clara gowns originate in Spain, however you can find them at shops in Canada including Priceless Brides in Suldbury and The Bridal Distribution by Yeldon in Brockville. Looking for something simple? Consider the Cotton Cady Maddox Gown from J.Crew. Priced at $700 USD, this tank dress features a scoop neckline and A-line skirt. It has a belt that ties into a bow in the back. The pockets are perfect for tucking away a copy of your vows... just in case you forget them. J.Crew has been selling wedding dresses with pockets for a few years now, and the trend is finally carrying over to numerous mainstream bridal gown designers. Check out the other pocketed dresses at JCrew.com and you can call J.Crew weddings at (800) 205-3877 to arrange shipment to Canada. From the Vineyard Collection by Priscilla of Boston, you can find this gorgeous Lindsey gown. This silk taffeta ball gown features rich pleating and a ruched bodice. The pockets sit on the side seams at the hip. You can find Priscilla of Boston wedding dresses at Evalina Couture in Calgary, Blush Bridal in West Vancouver, Pearl Bridal House in Mississauga, and The White Dress in Ottawa. If you have already picked out your wedding dress and it doesn't have pockets, they are very easy for your seamstress or designer to add in. They just have to open a seam at the hip and sew in the pockets. So, if you love the pocket trend, you don't have to miss out!